Simple and intuitive interface, fast performance, a variety of features and supported media types will make AVS Data Burner application a convenient software to create data CD and DVD. · Burn your data on the next-generation Blu-ray Discs and take full advantage of the new high-capacity storage technology (25 or 50 GB per Blu-ray Disc). With AVS Data Burner it is as easy as common CDs or DVDs. · AVS Data Burner supports CD-R/RW, DVD+/-R, DVD+/-RW, DVD-RAM, Double/Dual Layer DVD and the latest Blu-ray technology BD-R and BD-RE. · Designed and tested for IDE, SATA, SCSI, USB, and Firewire drives. Works easily with most CD/DVD recording drives. · Import previous session and add new files to an existing session - even for DVD formats. It does not matter what software you used to create this disc before. 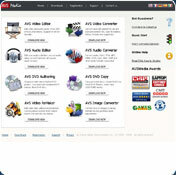 · Easily add, delete, replace, rename, and copy files and directories on CDs and DVDs. · Write files or folders with right-click and selecting the Send To option. · Create, write and even edit disc images (ISO), remove or add files and folders from/to images. · Organize your burning tasks into projects to simplify everyday work. You cannot download any crack or serial number for AVS Data Burner on this page. Every software that you are able to download on our site is legal. There is no crack, serial number, hack or activation key for AVS Data Burner present here. Our collection also doesn't contain any keygens, because keygen programs are being used in illegal ways which we do not support. All software that you can find here is freely downloadable and legal. AVS Data Burner installation package is prepared to be downloaded from our fast download servers. It is checked for possible viruses and is proven to be 100% clean and safe. Various leading antiviruses have been used to test AVS Data Burner, if it contains any viruses. No infections have been found and downloading AVS Data Burner is completelly problem free because of that reason. Our experts on malware detection tested AVS Data Burner with various spyware and malware detection programs, including fyxm.net custom malware and spyware detection, and absolutelly no malware or spyware was found in AVS Data Burner. All software that you can find on our servers, including AVS Data Burner, is either freeware, shareware or open-source, some of the software packages are demo, trial or patch versions and if possible (public domain licence), we also host official full versions of software. Because we want to be one of the fastest download sites on the web, we host all the software including AVS Data Burner on our servers. You cannot find here any torrents or download links that would lead you to dangerous sites. Rate AVS Data Burner 2.1.7.112!